Magna International Inc. headquarters will stay put at 337 Magna Dr. in Aurora, Ont. Magna International Inc. has put a hold on construction of a new corporate headquarters and research-and-development centre in King Township, about 60 kilometres north of Toronto. Magna’s headquarters will remain in Aurora, about 50 km north of Toronto, until at least 2022. “We recently made arrangements with our current landlord to extend our lease in Aurora, and for now we are taking a cautious approach with our global headquarter plans,” Magna spokeswoman Tracy Fuerth said in an emailed statement to Automotive News Canada. The international auto parts manufacturer purchased a 105-acre property in King Township in 2015, with the original plan of building a new headquarters there by December 2017. 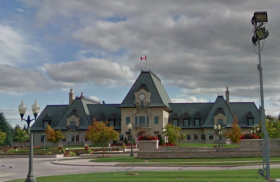 It had intended to consolidate its headquarters and research and design operations in King Township a news release said in May 2015. The Globe and Mail originally reported the entire facility would be 200,000 square feet. The proposed complex was to include a one-storey, 120,000-square-foot research and development building, underground parking, softball diamonds and a pool, according to the Aurora Banner. A spokesperson for King Township told Automotive News Canada that Magna had scaled downed its plans a number of times. “Magna International Inc. confirms that the project to construct a new corporate headquarters building in King Township has been put on hold. We have recently completed discussions with our landlord and have reached terms to extend our lease for the Aurora headquarters building until 2022,” Fuerth wrote. “This provides Magna an opportunity to monitor the macro-economic conditions impacting the automotive industry and to continue evaluating our future needs. Fourth said she didn't know how much the proposed King Township building was originally going to cost the company. The change in plan is costly to King Township, where Mayor Steve Pellegrini said back in May 2015 the move would bring 625 jobs to his municipality.